Great day for us in Helsinki today! We came home today with three new titles - Junior Helsinki Winner-16 and Two Helsinki Winners -16. Our little Niki (Raven's Tot Morning News) won Junior class and became also Best Male, getting second title - Helsinki Winner. 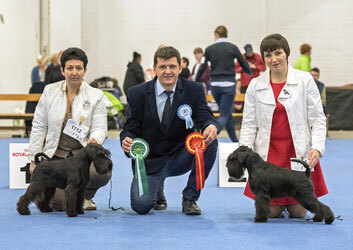 Our sweet Sandra (Raven's Tot Keen Sensation) went all the way to BOB and got Helsinki Winner -16 title. We are very thankful to our judge Calin Margineanu for appreciating our dogs so high!